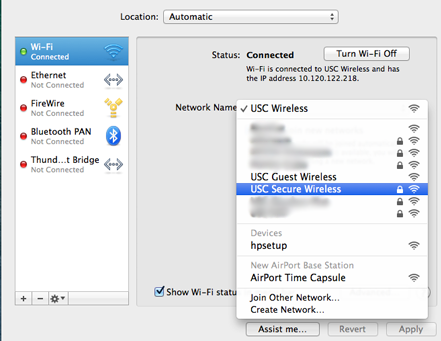 This page provides instructions on how to configure a computer running Mac OS X Lion 10.7, Mountain Lion 10.8 or Mavericks 10.9 to connect to the USC Secure Wireless network. Click Network under Internet & Wireless. If Status is set to Off, click Turn Wi-Fi On. 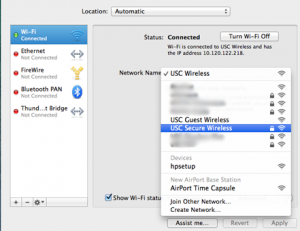 From the Network Name pulldown menu, choose USC Secure Wireless. 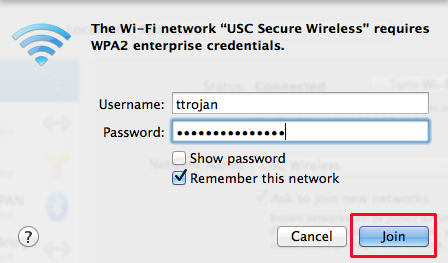 In the The Wi-Fi network “USC Secure Wireless” requires WPA2 enterprise credentials. screen, enter your USC NetID username in the username: field and enter your USC NetID password in the password: field. Your USC NetID is the username and password you use to connect to services such as my.usc.edu and Workday. 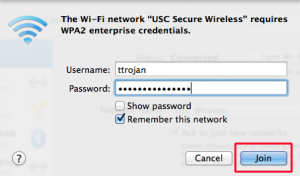 The first time you connect to USC Secure Wireless, you will be asked to verify the certificate for USC Secure Wireless. Click Continue to accept the certificate and connect to the network. Once you are connected the Status: field will changed to Connected. 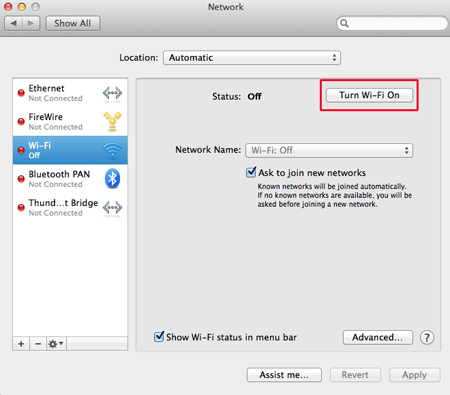 Click the lock in the lower left corner of the Network screen to lock in these changes and close the Network screen.